In what seems like a never-ending quest to find the best of the best in various clean beauty product categories (see my “ultimate guides” if you’re unfamiliar), one product category is even more subjective than natural deodorants and natural mascaras: natural perfumes. So instead of creating an “ultimate guide,” I instead decided to round up my personal favorite scents in the three major scent profiles that appeal to me: floral, spice and wood. If you are also drawn to these types of notes, you’ll find this list helpful. If you’re drawn more to the scents of citrus, greens, earth and rich dessert, my picks may not work with your senses. But, I would love to know your favorites within those particular scent profiles! That’s not to say these are the only fragrances I wear; it does mean, however, that most perfumes that strike my fancy have these scents as more dominant notes. Not to be confused with what’s newly updated on my “favorites” page, this is a sampling of natural perfumes from various brands that got the “ooh, that smells good and I’ll wear it” approval from me based on the types of scents I like. Typically, I like to have a small arsenal of go-to scents in my natural perfume collection, with just two or so earning the “signature scent” status. I like to switch up my daytime and evening scents, though I do love having that one go-to scent that I can wear to the office and refresh before happy hour or dinner. Perfumes that earn the go-to honor from me are ones that make me feel beautiful, smell good (obviously) and capture the positive attention of the people I’m constantly around, including my coworkers and significant other. But, to narrow it down even more, the natural perfumes that eventually make it onto my favorites, ultimate repurchase list have to do one thing: last. While I know because natural perfumes don’t contain the harmful phthalates and synthetics that prolong lab-created scents in conventional perfumes, I — like many of you — desire a scent that will keep for more than an hour or two. The ultimate floral bouquet, Aroma M’s Camellia Perfume brings together all the major players — jasmine, gardenia, neroli, geranium and rose — and then cuts it with frankincense. See why it got my attention? I reserve this perfume for evenings, as it’s a bit heavier, and it only takes a bit to last all night. That’s saying a lot of a cleaner perfume! 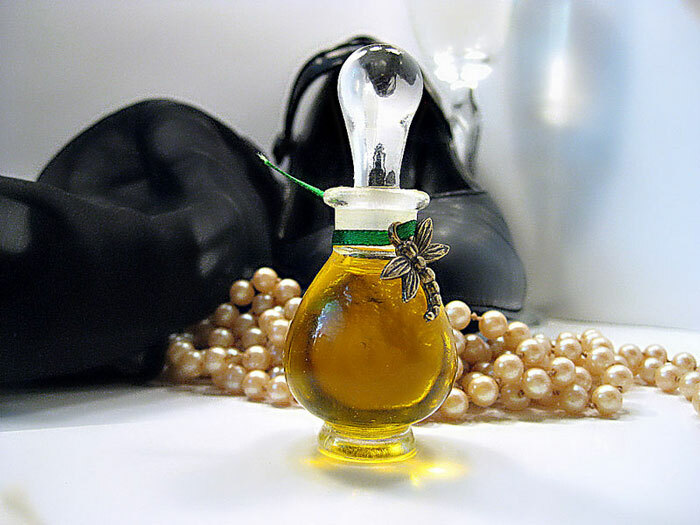 Talk about the perfect name for an elegant, classy natural perfume great for day and night! Little Black Dress by Esscentual Alchemy features jasmine, ylang ylang, sandalwood, palisander rosewood, ginger, bergamot, civetta, rose, black elder and lily. What. A. Masterpiece! The ultimate minimalist perfume with depth, Lurk RSW005 brings together notes of warm sandalwood and earthy rose in a perfume oil that wears well all day despite its oil-based formula (though it’s now also available in a spray which I have yet to try!). The rose is subtle and not overly feminine at all. Non-rose lovers may be converted by this perfume. I know I was! Probably the most unique scent in my current collection, Posso by Osmia Organics is strikingly more grounding and woodsy than its floral-heavy sisters. Base notes of violet leaf and frankincense ground your senses while Bulgarian rose absolute flirts with your senses. Lemon balm and grapefruit cut through those two scent profiles, brightening everything up without making the scent feel like a perky head cheerleader. And finally, Virginia cedarwood brings it all together with a sense of calm and cozy. Rose. Geranium. Jasmine. Wood. This is basically kimberlyloc in a rollerball, and after sampling a small vial of this romantic blend, I purchased a full size to roll on throughout the day. If Wild Heart becomes available in a spray (and in a body wash and a body oil and a body lotion and anything else I can sink myself in), I’d easily scoop all those up, too. I like how pared-down it is, yet its scent offers depth thanks to a slice of wood and a pop of geranium. Jasmine lovers: Make a point to try Fair Verona. Made with jasmine blossoms and touches of bergamot, grapefruit, sandalwood, and mimosa absolute, this luxury natural perfume has the depth of my favorite flower cut with happy citrus that makes my heart burst. I’m hanging on to what’s left of my small sample-with-purchase vial and will soon secure my first full-size purchase so that Fair Verona gets her special space on my perfume plate. I’ve mentioned before that tuberose is my secret floral obsession, but when it’s paired with jasmine and classic rose, I can’t help but want to yell it to the world that there’s a winner on our hands here, and it’s True Nature Botanicals’ Noble Floral Solid Perfume. But I restrain myself because while solid pefumes are charming (and True Nature Botanicals’ heavyweight, luxe packaging is absolutely stellar), I find that solid perfumes just don’t last on me. Instead, they’re lovely base layers for additional perfume oils and eventual eau de toilettes or parfums. TNB, do you hear me?! I would love to see an expansion of this scent, as it takes the best flowers and packs it into one ultra-feminine scent.